Brought to you by Wet North Productions. 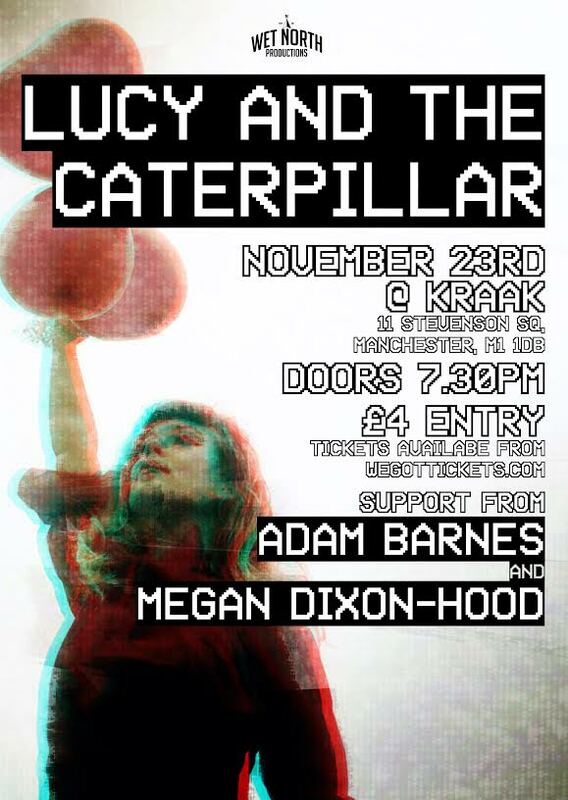 Lucy And The Caterpiller is Lucy Conroy from Burnley, near Manchester, where she now lives. A mainly acoustic singer-songwriter, the Caterpillar bit is the pet name she uses for her miniature guitar. Described as everything from a Mancunian Jean Seberg and a female Jose Gonzalez to a cross between Vashti Bunyan and Destiny’s Child, Conroy actually sounds more like Kate Bush’s self-consciously quirky kid sister or Violet Elizabeth. surrounds the city. He is a folk artist; a haunting songwriter and an honest performer waiting for some more people to take a step back and listen in. With the natural ability to capture the emotional sentiment within a song, to twist and perceive lyrics to compliment his melodies, and give you the opportunity to fall in love with well written music, at such a young age still you wouldn’t be blamed for thinking this man is telling you stories beyond his years. Megan Dixon-Hood combines haunting melodies with pitch perfect ethereal lead vocals. Her broad musical background reverberates through her songs, delivering atmospheric, spine tingling melody with creative, yet heartfelt lyrics. Her confident, naturally powerful voice captures and hypnotises her audiences, while her stage presence creates the perfect synergy of vocal control and performance. Whether it’s a full production or simply Megan and her Piano, her soaring voice will leave you yearning for more.